ICU at Canberra Hospital is an impressive ward. The staff there work in pretty stressful surrounds. Many patients in ICU are critically ill. Many are in intense pain. Hearing someone cry out in pain must be stressful for the staff caring for that patient, the staff working tirelessly to ensure the patient’s comfort. In ICU there is the extra layer of stress for staff that comes from well-meaning family. Nobody likes seeing a loved one sick or in pain. It is really hard for family to stand back and watch. They want their loved one fixed …… NOW! I’ve learned that some things simply can’t be fixed. So patients and loved ones put pressure on staff unintentionally. The ICU nurses are passionate about their work. They all have a fabulous bedside manner and outstanding clinical skills. When people move on from ICU, they usually thank the doctors and nurses for their care. The ICU experience is quite intense and patients often form strong bonds with staff. There is another very important group of staff that make up the wonderful team in an Intensive Care Unit. This is the group of Wards Men, affectionately known as the wardies. I believe the wardies are the unsung heroes of the ICU. Most of you would know that the wardies are responsible for transporting patients to and from tests, between wards etc. What I didn’t know before my hospital experience, is that the wardies are responsible for all the major manual handling of patients. 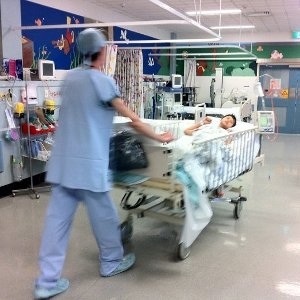 In a ward such as ICU, many of the patients require significant handling. Patients that are unconscious, have multiple breaks, patients in all kinds of braces, paralysed patients etc, require regular moving to avoid pressure sores and ensure comfort. I needed to be rolled every 3 hours. Because I could not wiggle at all, regular position change was the only way to avoid pressure sores. That was it, I was reduced to hysterics and a friendship was born. Following a brainstem stroke, many patients experience unusual episodes of excessive laughing or crying. In some patients the emotion is appropriate to the event, but the level of response is disproportionate to the event e.g. a rude comment from a loved one that would normal lead to a sigh, instead leads to uncontrollable crying. Alternatively, the excessive emotion can be inappropriate to the situation e.g. the death of a relative may lead to uncontrollable laughter. The cause of these emotional responses is still quite controversial. I had started to have uncontrollable fits of laughter and the Wardie (Dave) set me off that night. He was the Wardie that would look after me during the night every second week for the remainder of my stay in ICU. Dave alternated weeks with another wardsman. Both these night wardies treated me with so much respect and dignity. Had I passed Dave in a dark alley, I would have been frightened but I soon saw passed his tough exterior and realised he was a big marshmallow inside. He would hate for me to ‘out’ him, but it’s true. Both these wardies made my stay in ICU better. Their attention to detail really surprised me. As they rolled me several times a night, they never rushed. They moved arms, legs and pillows until they were sure I was comfortable. Each time they rolled me, they would also move the recliner to the opposite side of the bed so that the family member spending the night by my side, could see my face. I soon developed relationships with the day wardies as well. They were responsible for getting me in and out of bed and to and from the shower. This bunch of big tough men proved they all had hearts of gold. Their level of respect and compassion blew me away. Many of them would pop in to say hello and see how I was during their shifts. 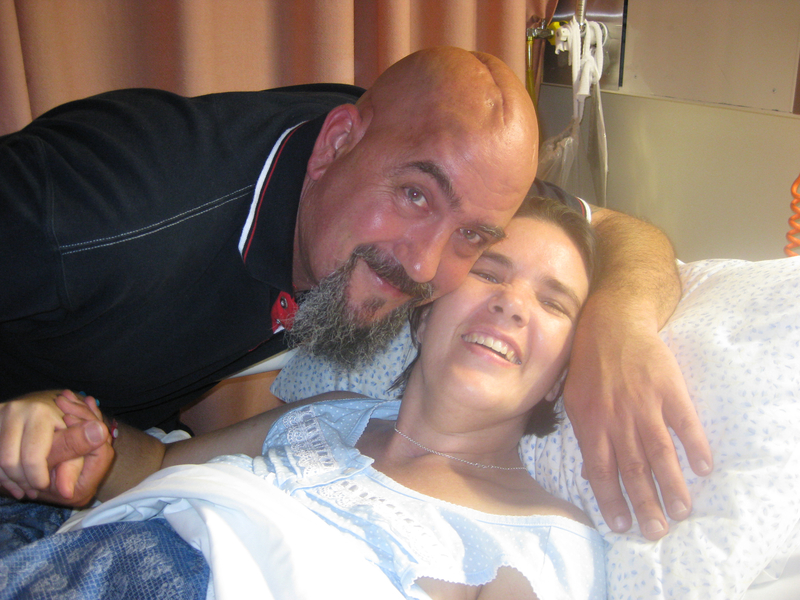 Dave became part of the family and a source of comfort and support for my entire family. Being completely vulnerable, as I was, and with being moved being painful and frightening, I had to trust these men. The level of care they provided was astounding. When I left ICU, I was really sad to have to say bye to the wardies. Many of them continued to visit me in other wards for the duration of my hospital stay. I am still in touch with Dave and I think we will remain friends. Next time you are walking through a hospital and see a Wardie pushing a bed, remember wardies are so much more than that. They are a critical part of the bigger Health Care picture and their skill, compassion and empathy make every patient’s hospital stay more bearable. I had the best night wardie also. He knew just how I liked to be positioned and where I wanted pillows and he never rushed away until he knew I was perfectly happy. The nurses we very busy and most were happy to just quickly roll me and run away. Bless these kindhearted men! Had a great big laugh from that! Thanks for sharing!